As Pixar’s prequel, Monsters University (2013), premieres, some have highlighted the shift within the powerhouse animation studio towards recycling older properties and thus perceived creative stagnation. While Toy Story 3 (2010) was celebrated as a triumph, there were more mixed reactions to Cars 2 (2010) and Monsters University (a Finding Nemo sequel is also forthcoming). Pixar may be a victim of its own success, but other important factors are at work. Innovation invariably gives way to nostalgia for that success, but this risks overlooking nostalgia’s continuing use-value for specific generations—specifically, in the historical parallels between Pixar and Disney. The reassurance of nostalgia often anchors innovation’s newness. Despite being the first digitally-animated feature, Pixar’s debut, Toy Story (1995), was deeply nostalgic—reenacting the baby boomer’s fond memories of growing up within the material prosperities of post-war America. The tension between Woody (Tom Hanks), the all-too-earnest cowboy, and Buzz Lightyear (Tim Allen), the lovably-misguided astronaut, replayed the transition from a `50s obsession with frontier Westerns to the `60s atomic-age space race. This generational address was more acute in Toy Story 2 (1999), which foregrounded Woody’s status as a valuable antique explicitly based on a 1950s television show. Somewhere in the eleven years between Toy Story 2 and Toy Story 3, however, that narrative faded. The third film’s nostalgia resonated for a very different audience. 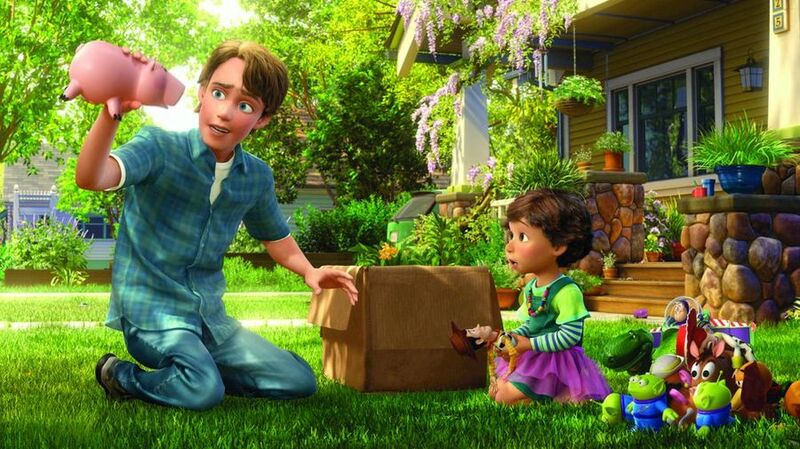 Its powerful ending, where a now teenaged Andy gives up his beloved Woody to a little girl, was more about the generation of kids who grew up with Toy Story. One couldn’t reproduce this effect with children today—it’d require showing them the first one, waiting four years before letting them see the second, and then another eleven years before seeing the conclusion. No child would go along with that (and, generally, our media consumption habits are such that if we discover something new—such as a television series on DVD or Netflix—the inevitable temptation is to devour it all at once). The specific effect that Andy’s decision has on teenagers and twenty-somethings today could never be repeated for another generation—it’s a useful demonstration of how historically specific audiences’ relationship to media texts can be. I suspect, over time, Toy Story 3 will lose some of its luster. I spent so much time unpacking the nostalgic trajectories of the Toy Story trilogy because I feel somewhere in there is also the story of Pixar’s continuing challenge. The premise of Monsters University, where Sulley (John Goodman) and Mike (Billy Crystal) head off to college, is a symbolic continuation of Andy’s departure for school at Toy Story 3’s conclusion, reflecting how Pixar’s core demographic is also now college-aged. It’s simple enough to highlight Pixar’s artistic rut by recycling properties over and over, rather than explore more original, ambitious narratives, such as 2008’s Wall-E. Yet the truth is the company is very much beholden to its loyal audience in ways that restrict the kind of innovation that helped distinguish Pixar in the early days of computer animation. Or, perhaps, the innovation comes in how to carefully negotiate those nostalgic impulses. Pixar’s journey over the years is not unlike that of the parent company it’s often fairly but misleadingly tied to—Disney. The idea is that Pixar is focused on squeezing older properties dry because of Disney’s corrupting corporate influence, but this requires a more nuanced understanding of Uncle Walt’s company. Like Pixar, Disney defined itself in the beginning through cutting-edge innovation in animation—the first successful integration of sound (as much the reason for Mickey’s popularity as anything), the first use of three-strip Technicolor (1932’s Flowers and Trees), the first feature-length cartoon, Snow White (1937), and so forth. Like Pixar then, Disney was both critical and commercial darling in the 1930s. The 1940s, however, were generally unprofitable, with government WWII contracts keeping the company afloat. But on the eve of “Disneyland” in the 1950s, the company discovered a whole generation of parents now nostalgically recalling their memories of Mickey and Silly Symphonies. This generational nostalgia sustained the ABC program of the same name, and paid for and promoted the theme park in Anaheim. Yet like Toy Story 3’s success with college-aged audiences today, it was somewhat luck—Disney leveraged broadcast rights to its old properties out of financial desperation. Meanwhile, Pixar waited so long in making sequels/prequels precisely because it feared being perceived as money-driven and creatively bankrupt (there’s also a parallel to Disney’s reluctant embrace of the now-ubiquitous “Princess” films, explaining why it took fourteen years after Snow White to return to the fairy tale genre with 1951’s Cinderella). In short, it’s not only about creative stagnation, but about an awareness that such recycling negotiates and reinforces the powerfully self-sustaining nostalgia which anchors the company’s success—both for Disney in the 1950s, and Pixar today.